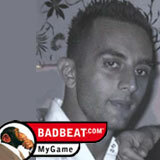 Now bankrolled and tutored by Badbeat.com, prospects look good for one young UK poker player. Stavros "LOTSandLOTS" Ioannou, one of the latest up and coming poker players to be sponsored and mentored by Badbeat.com, has begun the sponsorship with a winning streak that started with two MTTs then, the following week, 2nd in the €5k guaranteed €50 Turbo on Poker Time and 3rd in the $10k Guaranteed $5 Rebuy on Poker Encore for $2.1k. Ioannou, proud father of a seven year old son, has only just begun to feel the benefits of Badbeat.com sponsorship and mentoring. Badbeat.com, the original and leading poker staking and poker training site, has been sponsoring and mentoring promising players like Ioannou since 2005. This summer it made its revolutionary new MyGame poker training system, modeled on that experience, available free to anyone that wants to learn, win and transform the way they play. It builds players’ poker skills from the ground up by analysing actual play. Access to tutorials, the unique hands analysis tool, Report Cards, and Social gaming features are all free after registering a new account with any of Badbeat’s partner poker sites. A new iPhone app now enables MyGame poker trainees to compare Report Cards with others enrolled in the program and even get advice and access training videos from their phone. Yo All That Screen watching in your basement is starting to pay off! !